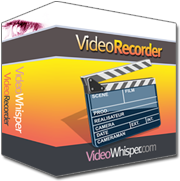 The VideoWhisper Video Recorder software can easily be used to add video posts and video comments to WordPress sites and on blog pages. To test a live demo of software on WordPress, just register a free account on the VideoChat Scripts site. The Video Posts Webcam Recorder allows the WordPress administrators and authors to record and insert videos in their posts. Previously recorded videos can also be imported into posts. The Video Comments Webcam Recorder allows WordPress users to add video comments as responses to posts or to other comments. If the user is not logged into WordPress he cannot access this feature. Integrates Strobe player. In both plugins administrators can view the list of video recordings and delete them. Video Posts Webcam Recorder > Settings & Settings > Video Posts menu. Video Comments Webcam Recorder > Settings & Settings > Video Comments menu. For both plugins the video recordings lists can be accessed from the Settings Page > 'Recordings list' or from the Plugins Page > 'Recordings'. Before installing, make sure your hosting environment meets all requirements. For video recording we recommend Wowza rtmp streaming server and hosting both rtmp and web on same server so scripts can access video files for conversion. Download latest WordPress zips or get this plugin from WordPress repository or search from WordPress backend (Add New and look for "videowhisper") to install automatically. Install from WordPress admin area > Plugins > Add New > Upload . Or you can manually copy the files from the zip file including folder structure to your wordpress plugins folder and obtain 'wp-content/plugins/videocomments' and/or 'wp-content/plugins/videoposts'. Enable the plugins from Wordpress admin area and fill the settings, including 'rtmp address' and 'Videos directory' there. The wordpress integration is based on a slightly modified php video recorder edition so you can also check that for customizing settings, integration and implementation of other features. After installing Video Posts Plugin wordpress users will have a recording button on the options toolbar in 'Add New Post' page or 'Edit Post' page. Video Comments Plugin inserts a recording button above the Comment box.